Book The Band! 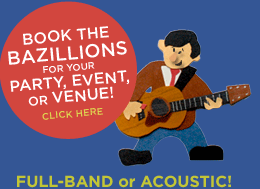 Acoustic or Electric, private parties or big events! Visit our store! 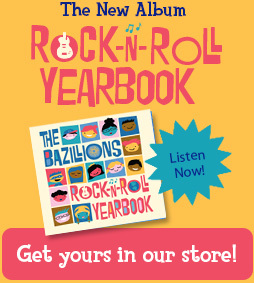 The Rockin' Video Collection DVD, CDs, and other great gift ideas! Fan Artwork! Download coloring sheets and see your work in our galleries! Rock-n-Roll Recess is exactly what a children's music album should be...If you'd rather share with your kids well-written, beautifully recorded songs about prepositions, careers and imagination than the traditional fare of animals, ABCs and "The Wheels on the Bus," then The Bazillions are just the band for you.